The Orange Tiny Terror (TT) combo is essentially the Tiny Terror head, coupled with a Celestion G12H-30 30 watt speaker in a square enclosure, with a carry on handle on the side. 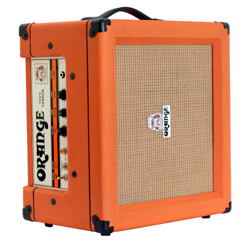 The amp is covered in the traditional unmistakable Orange tolex color. On first view the amp seems very stylish and the feel of workmanship screams quality. For a small single speaker combo the amp weighs at 37.5 pounds (17kgs) which is not on the light side but it is to be expected considering the fact that it is all tube, with two EL84 in the power section and two 12AX7 tubes in the preamp section. Controls are placed at the top and are labeled "Gain", "Tone" and "Volume". There is also one 1/4 inch guitar input jack, an "On/Off" switch, a "Standby" switch which also selects from two power modes, either 7 watt or 15 watt operation and a ruby color LED indication when the amp is on. The built-in Celestion G12H-30speaker is connected from a 16 ohm speaker output jack which can be unplugged if an external speaker connection is desired. The TT can power (1) 16 Ohm cab, (1) 8 Ohm cab, or (2) 16 ohm cabs at the same time and the built-in speaker has an option to be taken out of the chain. While diminutive in size, the Orange TT combo packs a hefty 15 watt tube punch which is enough to power a recording session or small to mid size gig. The no frills controls are designed for musicians that rely on their guitars and pedals for tone shaping. The "Tone" eq is responsive and dials in some midrange grit as well as treble when moved clockwise from the center. Counter-clockwise it provides a smoother, more bassier tone, reminiscent to a Santana solo. The amp tone by itself ranges from a clean, slightly hairy tone to an overdrive crunch. In the middle there is enough territory with useful tones for all sort of rockers. Pushing the gain to the right gets some serious Malcolm Young rhythm snarl. With the help of an overdrive pedal I managed to get some screaming hard rock rhythm and lead tones reminiscent of Van Halen or early Metallica. The Tiny Terror also took really well to other pedals - I tried my Sansamp TRI-OD, AMD DT-2 distortion pedals and they both had tons of great setting to choose from. Chorus, flange and other pedals fared well but I found their use limited due to the lack of effects loop. For studio sessions the Tiny Terror turned out to be a real champ. I personally like my guitar tone to be as pure as possible with fewer effects in the signal chain so I just used the Tiny Terror with an overdrive in front (in this case DDyna Thinman or Voodoolabs Sparkle Drive). The 7 watt setting allowed me to get power tube saturation earlier without having to crank the amp in full, which in effect resulted in less signal bleed and fewer complaints from studio B which had a drum tracking session going on. The sound was meaty and throaty, with a midrange that is unmistakably Orange. Some amp manufacturers are happy enough to go for a Marshall or Fender approximation when they voice their amps, but as is the case with Orange, they have gone after their own sound. Considering their pedigree this choice totally makes sense. The difference is that their tone when pushed is raunchy and smooth in the lows and has an unmistakable throaty midrange growl that is its signature. The Celestion G12H-30 speaker handled well almost anything I threw at it at 7 watts. At 15 watts when pushed too hard (volume over at 3 o'clock) it started to overload but it transferred well on the recorded track as some extra fizz which I liked. Just to try how the amp will handle an external speaker I connected it to a 16ohm 2x12 cab I have loaded with Greenbacks and that turned into one mean practice package. Not to brag but I managed to overpower a competing guitarist with a 100 watt solid state amp next to me, so I felt that the Tiny Terror would definitely be at home at a small or mid sized gig, even with just its built-in speaker. I felt that the Tiny Terror was one well built British tone machine. With 15 watt tube power, I'd be happy to take it on the road, in the studio or as a practice amp at home - it has its own character and it is one that I really like. While the effects loop and eq might be missed at first, the tone is so sweet and so easy to dial that I quickly lost myself in the amp's magic.